What does it mean to be a fashion designer in 2019? 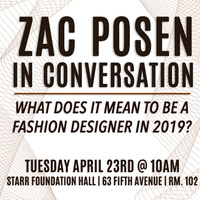 Renowned New York-based designer Zac Posen will sit down with Parsons’ Katharine K. Zarrella to discuss his creative journey, professional highs and lows, and what it takes to build a powerful, multi-dimensional brand in today’s fashion landscape. Pulling back the curtain on his oft glamorous and ever-evolving career, Posen—one of America’s best-known designers—will offer a rare glimpse into fashion’s dreams and realities. Presented by the School of Fashion at Parsons.